Here’s a deliciously sweet alternative to just canning carrots in plain water. We tried them out last week and loved them! I found the recipe on Creative Canning. It originally calls for using ginger, but we don’t really like ginger so I left it out. I canned baby carrots and some sliced carrots using this recipe. Yummy! Wash and drain carrots. In a large saucepan, combine the brown sugar, water and OJ. Heat over medium, stirring until sugar is dissolved. Keep it hot; you don’t have to bring it to a boil. 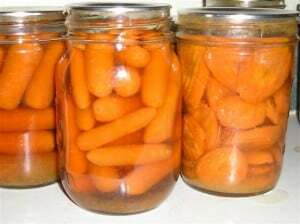 Pack raw carrots into hot/sterilized jars leaving 1 inch headspace. Fill jars with hot syrup, again leaving 1″ headspace. Tap to remove air bubbles. Wipe rim of jar with wet rag to remove any drips. Screw on sterilized lids. In a pressure canner, process pints or quarts for 30 min. at 10 lbs pressure. *TIP: Wide mouth jars make it much easier to remove the carrots when ready to eat. Do you have a favorite glazed carrots recipe? What’s your favorite way to can carrots? I like a mustard glaze. Pretty simple. 1/2 cup brown or Dijon mustard and 1 cup brown sugar. Heat over medium heat until brown sugar dissolves. I boil carrots first,drain and add them to the glaze. Can these be done in quart jars? Lol, just read a little slower and saw it says pints or quarts. Thank you for the recipe. I am getting ready to process carrots tomorrow. I just started canning this year. My kids think I’ve gone off the deep end. I am trying to make it so my food dollars go further. I get a lot of vegetables given to me through out the summer. My husband loves it. He knows after the Initial investment that all my work and monies involved will pay off in the long run. I am going to make a batch per your recipe. The remainder ( I have 30 lbs of carrots ) I am just going to process with water with a teaspoon of sugar per quart. Lay kids won’t eat carrots unless they are sweet. That has been my trick with the kids since they were babies. A touch of sweet a few grains of salt and a dose of black pepper and they will eat any vegetable put in front of them. Anyone with any other great ideas for veggies I’m up to suggestions.I have a lot to learn. Thanks again for the recipe. Is this the same recipe as in the blue ball cookbook? I made them last year. IJust my opinion but I don’t really care for the orange juice flavor to them. I was a little disappointed. They aren’t quite what I expected. Any suggestions? I am very into canning. Canned 500+ jars of food last year. Hey Kendra, I am going to try your recipe for carrots. Do you use frozen orange juice or Fresh??? To the person who used Vanilla instead of orange juice, how did they taste??? Hello, I made these carrots and they are very good. I have eaten a couple of jars since I made them last month but I did not “pre boil” them for 10 minutes before eating like I usually do with some pressure canned foods. I eat them right out of the jars. I know it is recommended to boil them for 10 minutes but I didn’t think these carrots would be necessary. Do you PRE BOIL your carrots prior to eating or just eat them out of the jars??? Thanks and I will be canning more of these in the future. I don’t really like cooked carrots cold, so I always heat them up. I don’t always boil for 10 min, though it is the safest thing to do. So glad you love them! Can you water bath them? No water bath canning low acid foods, such as veggies and meats. You must use a pressure canner, or you risk food poisoning and Botulism. wouldn’t the orange juice up the acidity enough? It probably would, but I’d still pressure can it since there’s no way to know if it would be safe to water bath can without testing the acidity level. I used the recipe without the orange juice…I added a splash of vanilla instead! It’s great 🙂 It makes a light syrup so the carrots still shine! Thanks a bunch! thanks for this recipe … I usually just can my carrots , open a jar, add peas, season & set on the table…. we all love peas & carrots together , so this should be a nice change. Been canning all my life & still love finding a new recipe I also dehydrate & freeze, but not too much the freezing because of the cost. Thanks for posting this recipe! I used your recipe as a base, but added minced garlic and ginger to the glaze as well. The jars are cooling right now, actually. I am planning on posting the recipe I used on my blog as well. I can’t wait to taste them. Thanks for your site, I love learning and reading all you have to offer! This sounds great! And I can eat these right out of the jar? Like a pickle? No added cooking like for canned green beans? Hi. My wife and I are really getting into canning this year. This simple recipe makes the best tasting carrots. We did ours in jelly jars and it worked out for small side dish meals. We have filled our shelves for the winter and can’t wait to try canning venison if I have a sucessfull season. Thank you everybody for your tips and ideals. I love this web site. I’d be careful using a water bath for recipes that call for pressure canning. You really do run the risk of botulism. I have just recently heard of “mock” apple pie using zucchini. Sounds good!! If I had any more zucchinis I’d try it, lol! Unfortunately, if any canning recipe specifies the use of a pressure canner, you cannot safely use any other canning method. Hmmm… this sounds interesting. Would never have thought to use orange juice! Will have to try it next time I have a batch of carrots to can. Really? You’d be interested in my love story?? LOL. Well, our anniversary is coming up, maybe that would be a good post to write then!